A few weekends ago I picked a large basket of ripe plums from the backyard and OH MY…. they were delicious! In the past, we’ve made plum jam, chilled plum soup, plum butter, etc. but as I was browsing for inspiration on what to do next with the plums I came across a simple and tasty recipe from Valentina’s blog cookingontheweekends.com. I didn’t have black quinoa or mixed baby greens, as her recipe suggested, so I swapped it for pear couscous and baby spinach instead. 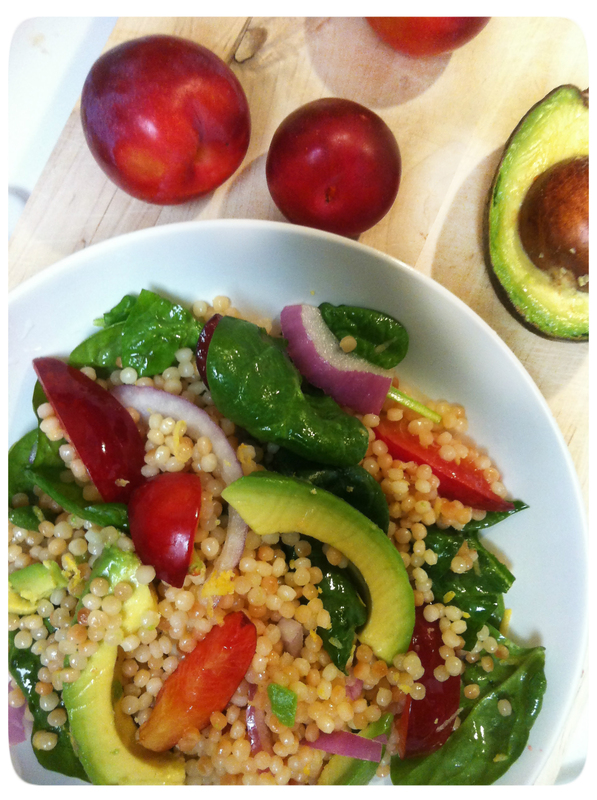 This salad was not only tantalizing to look at, but it was delicious and SO easy to make . The bright acidity in the dressing matched with the sweetness in the plums make this the PERFECT summer treat! Freshly picked plums and a cup of pearl couscous. Absolutely! Thank you for the wonderful recipe – we loved it! Avocados and plums – what an interesting combo!